This item is now sold out. I’ll order more if there’s enough demand. If you’d like me to do so, let me know. Thanks. 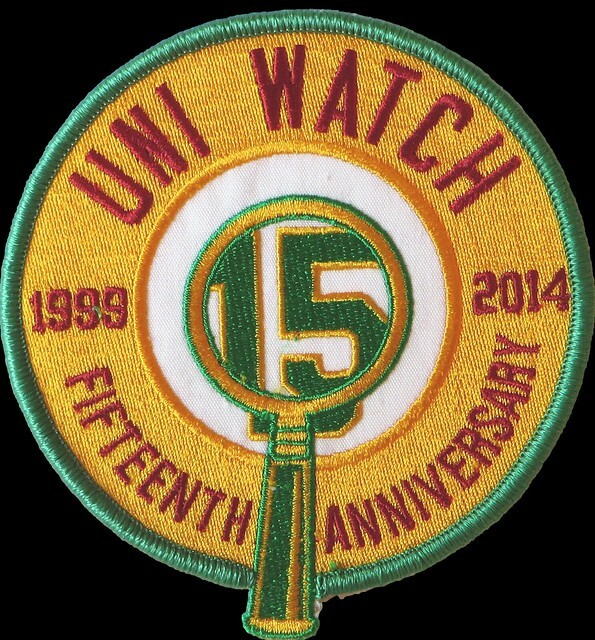 Thanks for your interest in the Uni Watch 15th-anniversary patch. They’re now available for ordering $13 for one, two for $24, or three for $35. at a new reduced price of $9.95 apiece, including shipping. The patch measures 3.75 inches across. If you include the little extension for the bottom of the magnifying glass handle, it’s 4 inches. 1. Square Cash: This is Uni Watch’s preferred payment method. It’s fast, it’s easy, nobody skims a cut off the top, and all you need is a debit card or ATM card — much easier and better than PayPal. If you haven’t used Square Cash before, don’t be scared — it’s reputable and you’ll like it, I promise! Just sign up here and then follow the instrux on this page, using plukas64@gmail.com as the payee address. Be sure to include your shipping address in the body of the email you send to me. 2. Amazon Payments. Just like PayPal, but administered by Amazon. Very easy to use if you already have an Amazon account (which you almost certainly do). For some reason, Amazon’s code creates a bunch of space above the payment button — not sure why. I realize it looks sort of unprofessional, but don’t worry, the button works properly. 3. U.S. Mail: Send a check, money order, or well-concealed cash payable to Paul Lukas, 671 DeGraw St., Brooklyn, NY 11217.